In 1987 the impresario Reinhard Schiele was developing the idea of building a mobile stage for his touring theatre company “ Schloßtheater Overhagen“ and was inspired in this by Shakespeare's Globe. It was not his aim to build an accurate copy of the London Globe, which had been under construction in London since 1987. His idea was rather to design a touring stage such as Shakespeare's company might have built in our times. His first plan was that of a twelve-sided structure, made, like the original, of wood, able to be erected and dismantled relatively quickly on a marketplace or fairground. Fire regulations soon put an end to this plan and so the present, much more complicated and much heavier steel and wood structure was developed. This made it no longer suitable as a touring stage and so, after a first summer season at the national garden festival in Rheda-Wiedenbruck, it stood empty for two years. A new home was sought for the 600 seat theatre. In 1991 the city of Neuss, together with the Bauverein, succeeded in bringing the Globe to Neuss, to a permanent site by the racecourse. 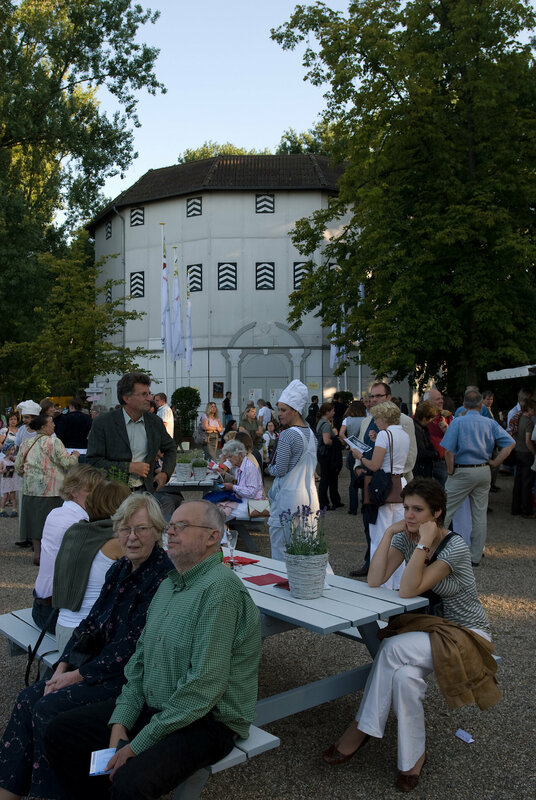 The Neuss Globe now hosts an annual Shakespeare Festival, with nationally and internationally renowned theatre companies, presenting Shakespearean heritage in ever new forms. In the new Neuss Globe as in the old London Globe it is the direct proximity of audience to actor that has such special appeal. In the Neuss Globe no-one sits further than ten metres from the action on the stage. In this way it is possible, without great technical effort, to bring theatre up close to the audience.